Fully of bright flavors, this kale tabbouleh is my new salad triumph. Made with just a few simple ingredients, it delivers lots of flavor and textures, and is well… simply GOOD. 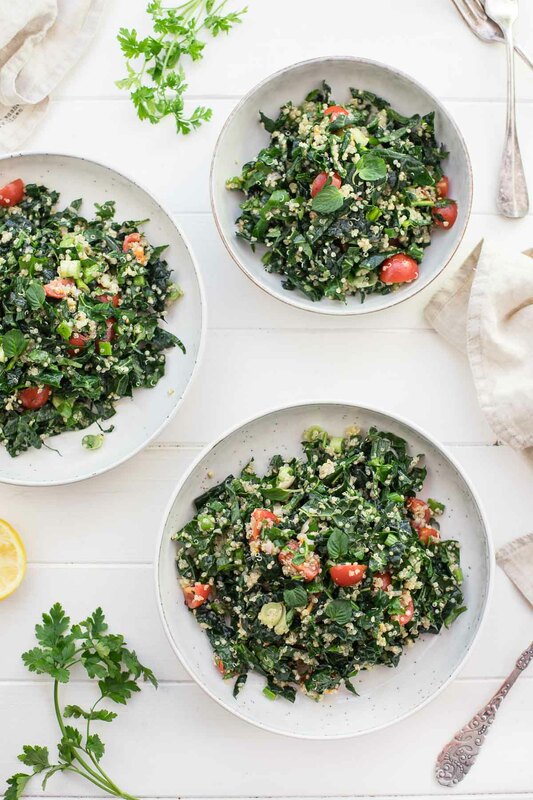 Super nutritious Tuscan lacinato kale is tossed together with fresh parley and mint, sweet cherry tomatoes, green onion and protein-packed, gluten-free quinoa instead of the traditional bulgur wheat. Ooh, and the dressing… cumin and sumac have made a grand entrance! So kale tabbouleh, who’d have thought? Well, this isn’t the first time I have given traditional tabbouleh a make over. I am simply in love with its fresh flavors and love to mix things up by adding things like roasted cumin carrots and almonds, or loads of herbs and chickpeas and even sweet potatoes, feta and pumpkin seeds. Yes, I simply can’t leave well enough alone. But what’s a tabbouleh without a little “Elle” factor? So trust when I say, if you are a fan of this Middle Eastern salad, then I am pretty sure you are going to enjoy this wintry version as well. It has all the parsley lemony goodness of the original but the nutrition factor has been dialled up a bit with the addition of kale and quinoa. Kale of course being the star which packs a lot of nutrition and powerful detoxification properties. For this recipe I use Tuscan lacinato kale, which sadly hasn’t made its way to supermarkets in my neighborhood. I’ve seen it once at REWE and a couple of times at one of my local organic food stores, but generally speaking you need make a trip to your local farmers market. A number of the organic food stands carry it. And if you want to enjoy it for more than just a couple of days, then be sure to store it properly. I always buys lots of it along with regular curly kale and red kale, and store them wrapped in a large lightweight plastic bag (I know plastic! A reusable plastic bag) in the fridge. This keeps it super fresh for a number of days. 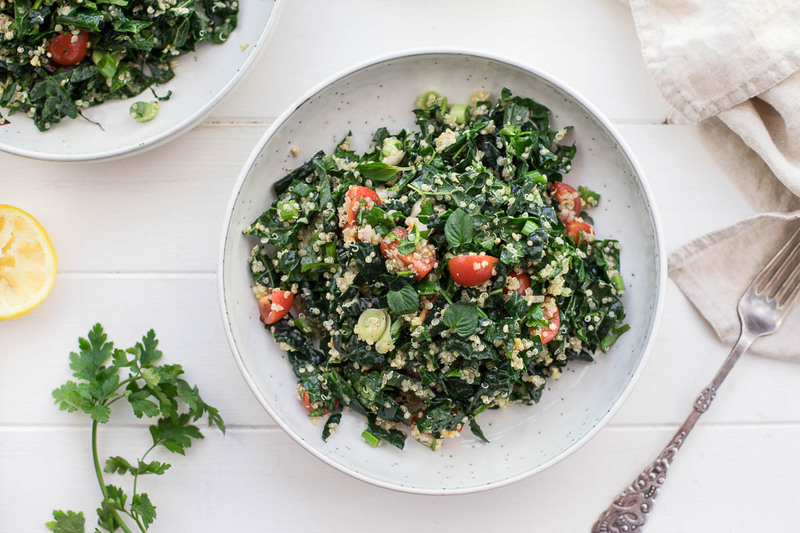 This delicious spin on tabbouleh salad is packed with protein, is low carb, gluten-free and vegan. Plus it makes a perfect make-ahead salad as it keeps really well. Rinse the uncooked quinoa in a fine mesh strainer. Drain well. Place in a medium saucepan and cook according to package instructions, in double the amount of water for about 20 minutes. Once most of the liquid is absorbed and the quinoa is light and fluffy, remove from heat, fluff with a fork, and let stand for another 5 minutes. Transfer the quinoa to a large bowl to cool. Add the kale, parsley, mint, green onion and tomatoes to the bowl with the quinoa. In a small bowl, whisk together the olive oil, lemon juice, shallot, cumin, sumac, salt, pepper and chili flakes. Pour dressing over kale mixture and toss together until salad is well combined. Season to taste with additional salt and pepper, if desired. Serve and enjoy! This salad keeps well in the refrigerator for several days. If you decide to use regular curly kale for this recipe, then I recommend using your hands, to knead and “massage” the kale until the kale becomes softened and reduces in volume. You can also do this for lacinato kale, but for this recipe, I don't think it is necessary. Since it's winter and not exactly tomato season, I use "Honigtomaten" for this recipe as they are super sweet and perfect for this type of salad. Looking for new ways to explore this salad. 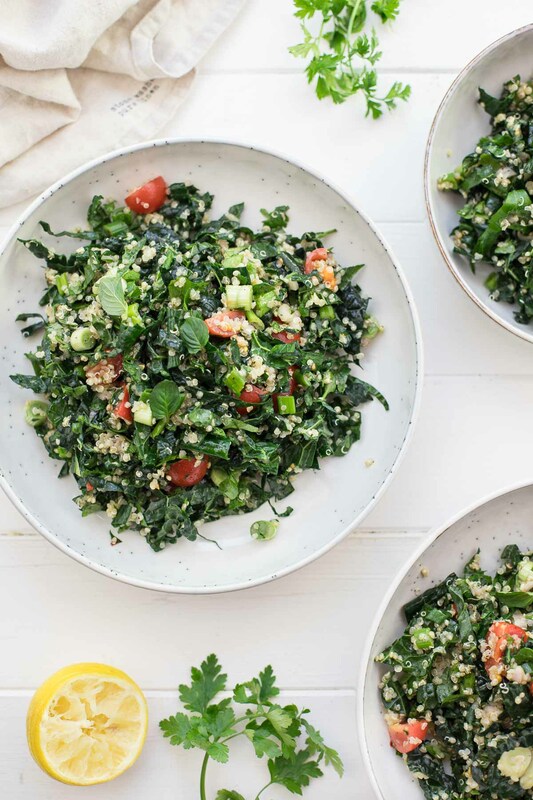 If you make this Kale Tabbouleh with Quinoa recipe, I’d love to hear how it turned out for you! Be sure to rate it and leave a comment below to let me know! Especially if you have tips for other readers. Or take a picture and tag me on Instagram @ellerepublic and don’t forget to hashtag #ellerepublic so I don’t miss it!